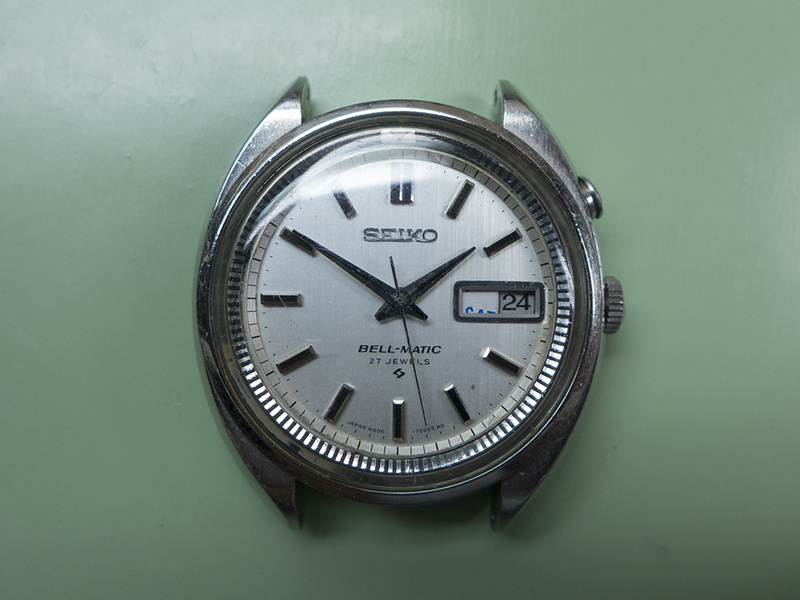 Seikos Bell-Matics are fun watches and have quite a following, there are a huge variety of models to choose from and prices are still sensible at the moment. The example featured below came in for a movement service and the first thing you can spot is there’s obviously a problem with the day changeover as the wheel is stuck between two days. 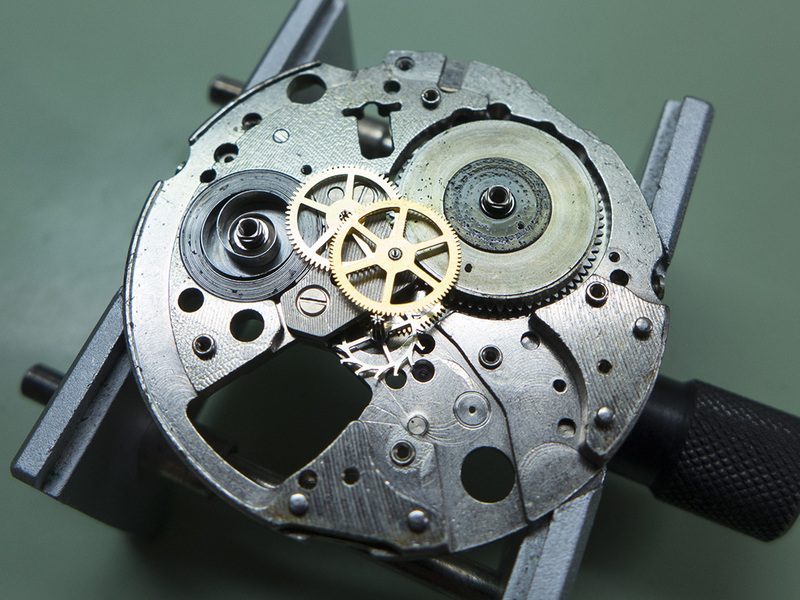 This is usually caused by a broken or bent day jumper, the component that locks the wheel into the correct position when it rolls over to the next day. 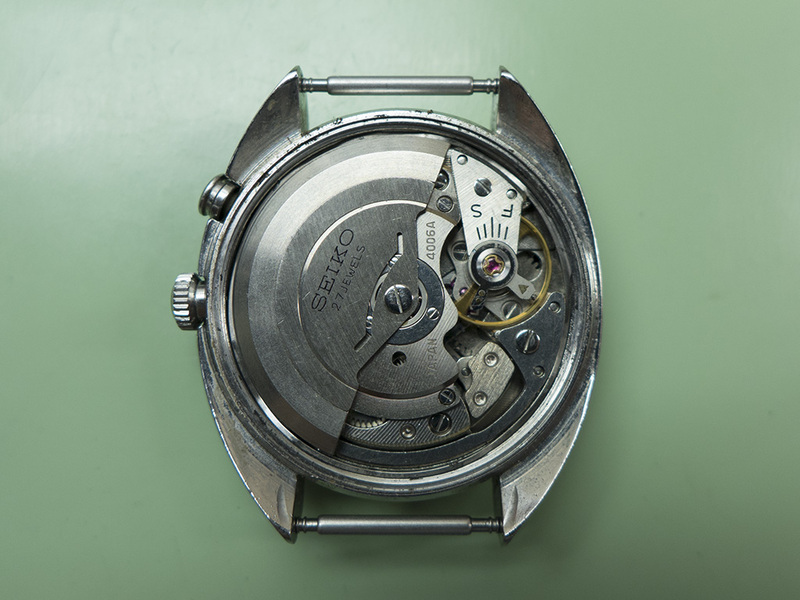 This is quite an early cushion cased example dating from July 1968 as can be seen from the caseback. 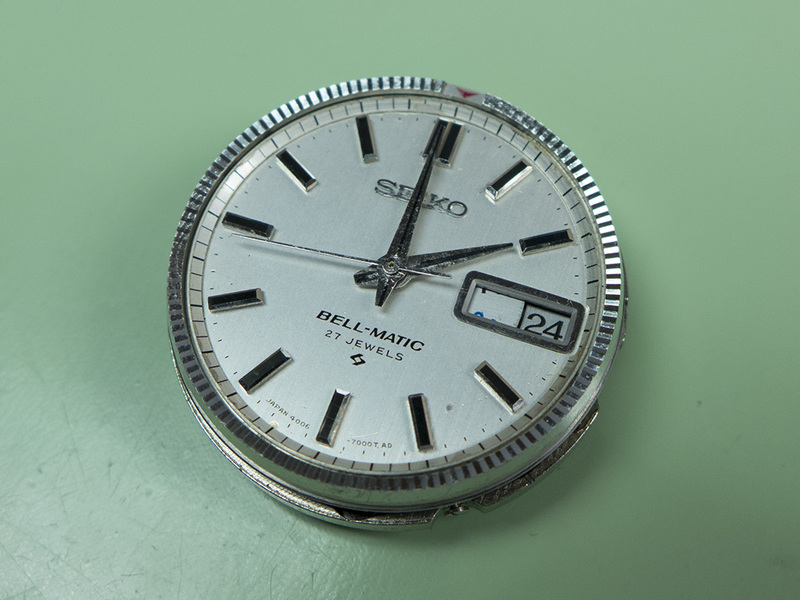 The Bell-Matics were first introduced in November 1966 and this was manufactured 19 months later. 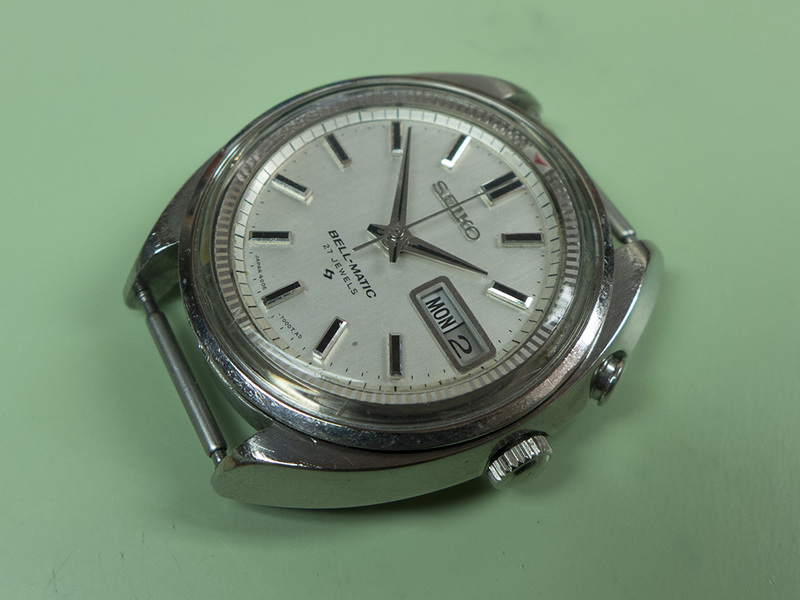 These earlier 4006’s had a higher jewel count than the later models, 27 as opposed to 17. 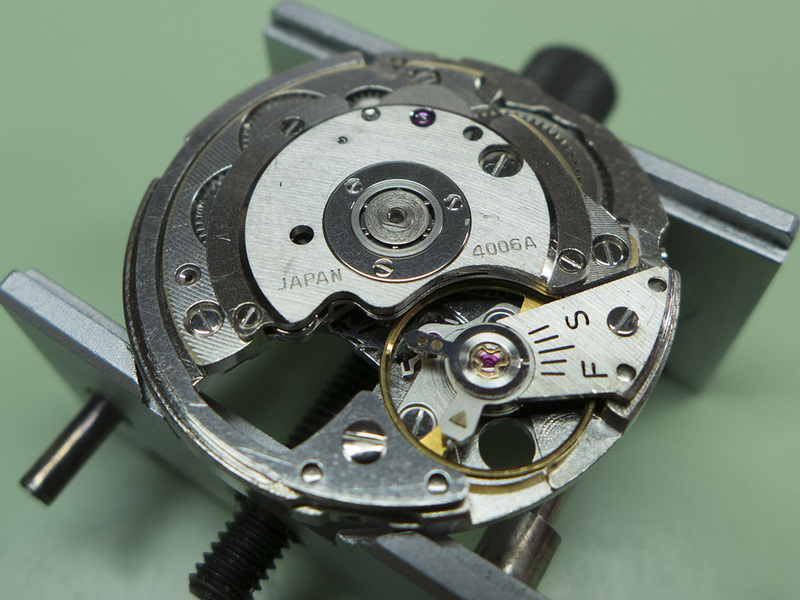 Winding the crown winds the alarms spring, then pulling it to the first click and rotating it turns the indicator setting ring. 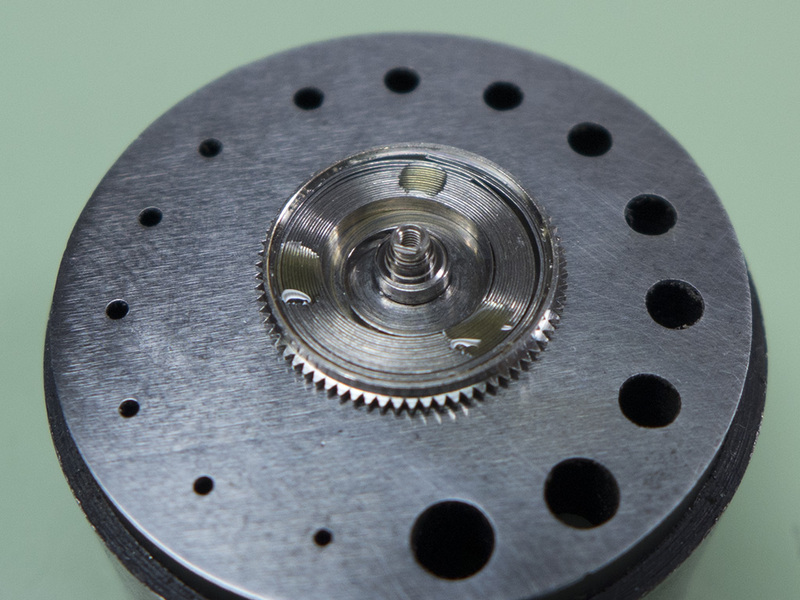 Set it at the time you need alerting then pull the little button out above the crown. When it sounds press the button back in to silence it! 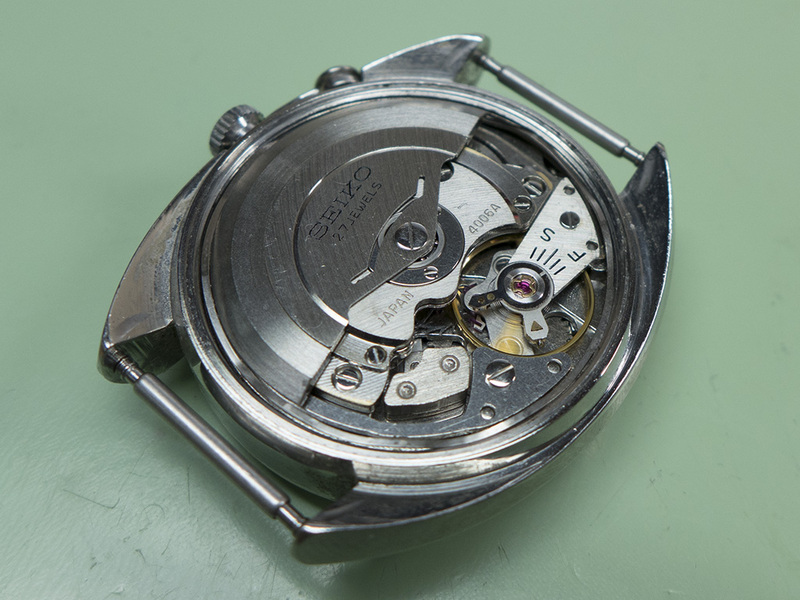 With the caseback removed the movement doesn’t appear to be in too bad a shape, a little dirty but nothing seriously amiss. 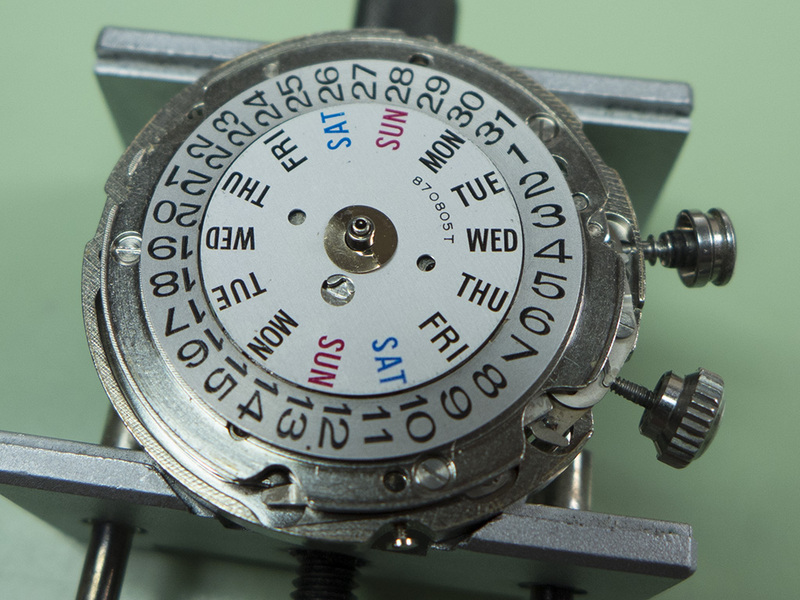 With the movement out it’s time to see what the problem is with the day changeover, so lets get that dial off. 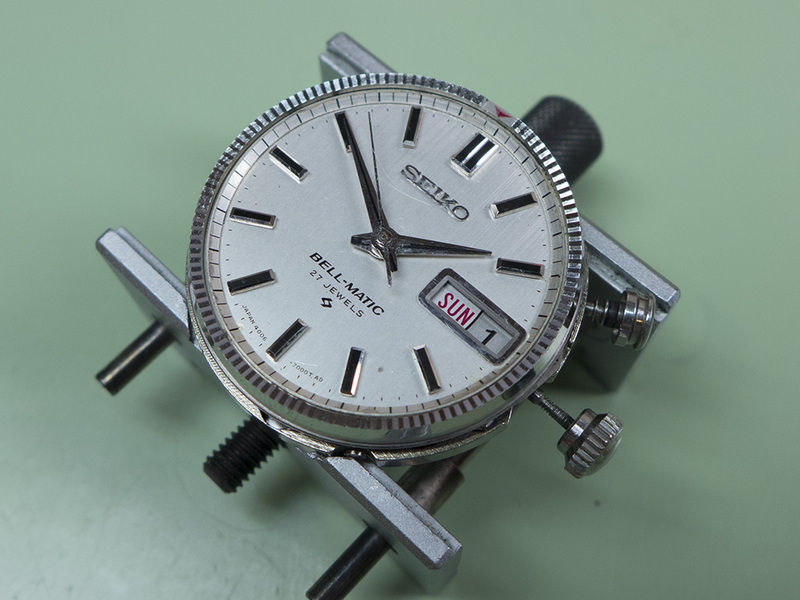 The indicator ring is removed first by undoing a couple of screws and removing the locating clips. 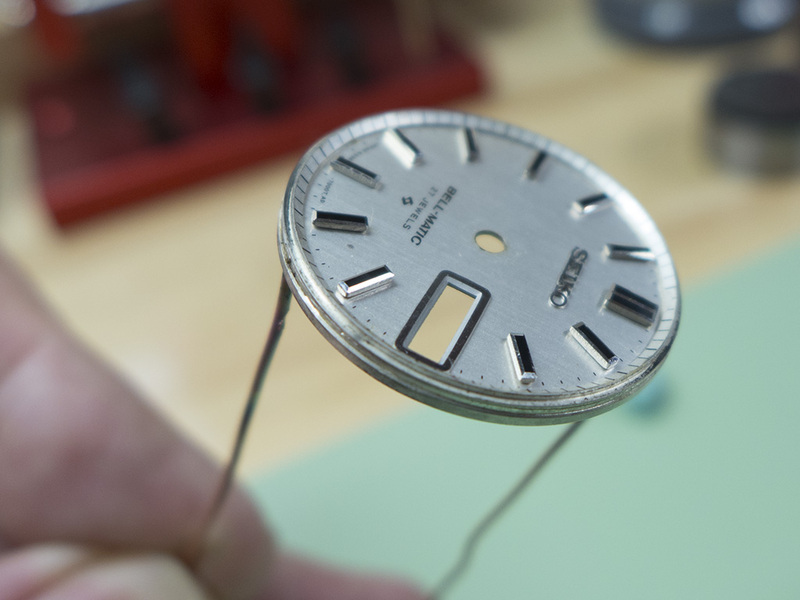 The dial is then removed by undoing the screws that clamp the dial feet down. 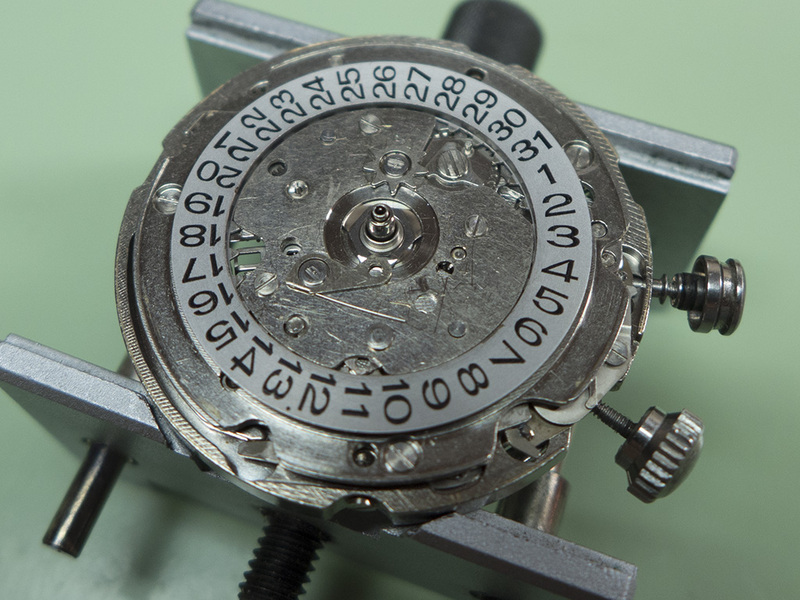 Well that’s the normal way but the dial on this just came away in my hand once the indicator ring was off. 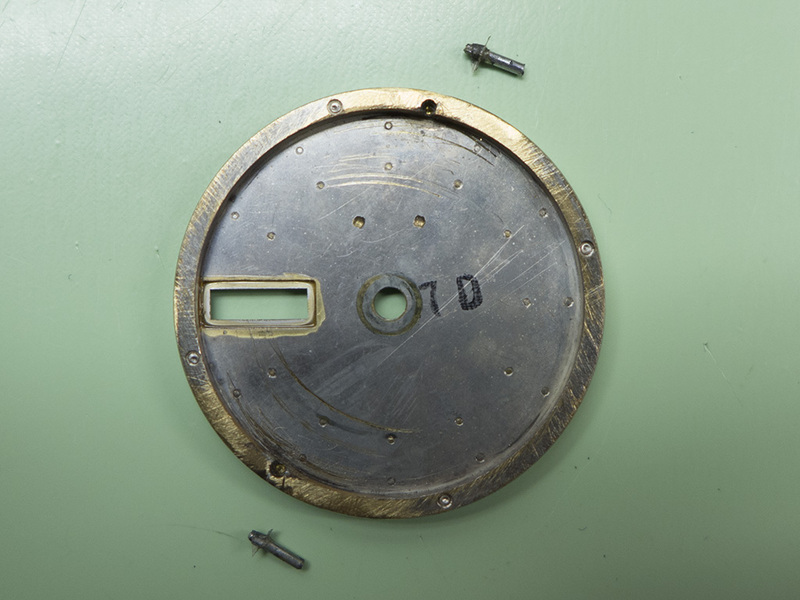 The original dial feet had been broken off and a new pair had been made and glued in place. 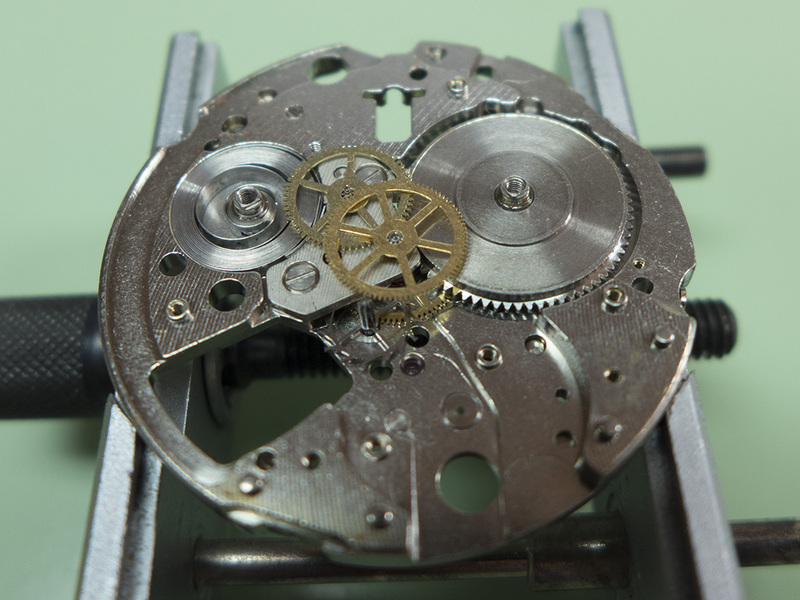 This had obviously worked for some time but the watch may well have received a jolt or shock that was great enough to break the joint. This was the cause of the day wheel problem, the jumper wasn’t actually bent or broken. 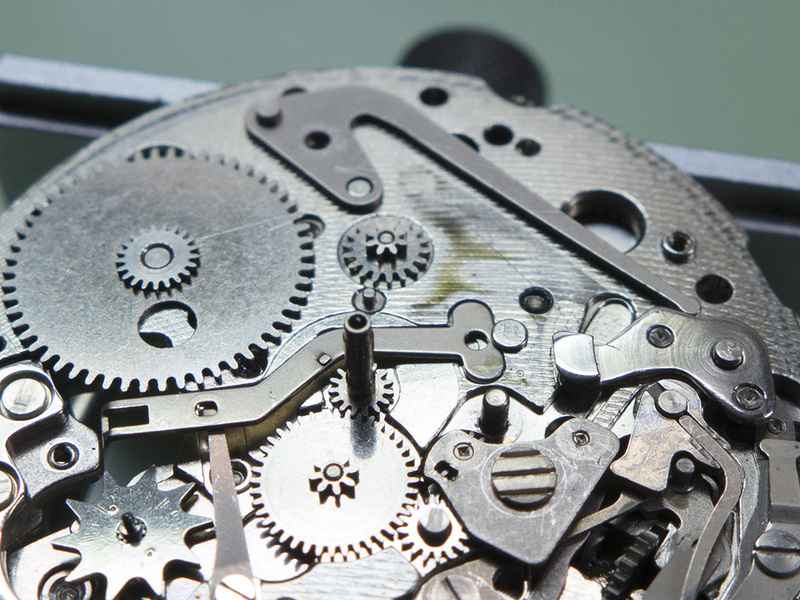 What happened is that when the dial became detached from its feet it lifted slightly, and as it’s the dial that holds the day wheel in place that lifted too. 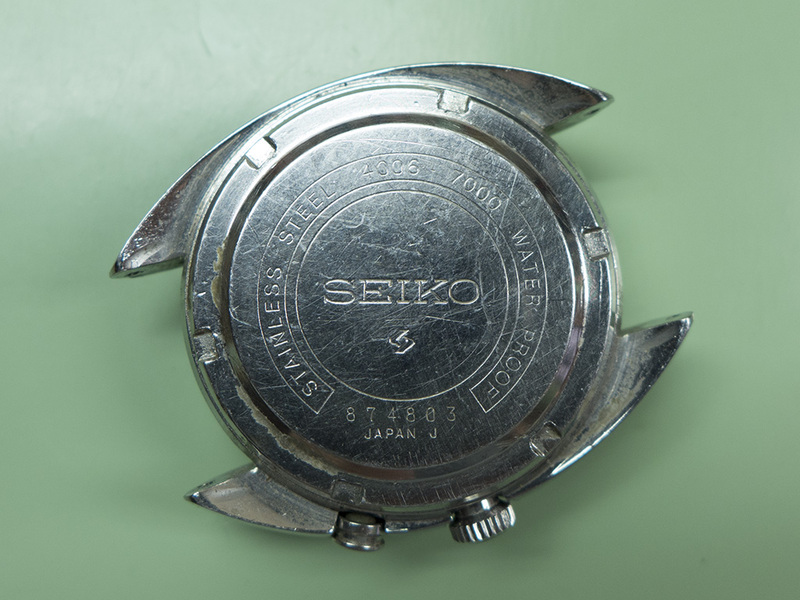 This meant the jumper no longer located in the little star wheel on the back of the day wheel with the resultant misalignment and failure to advance. 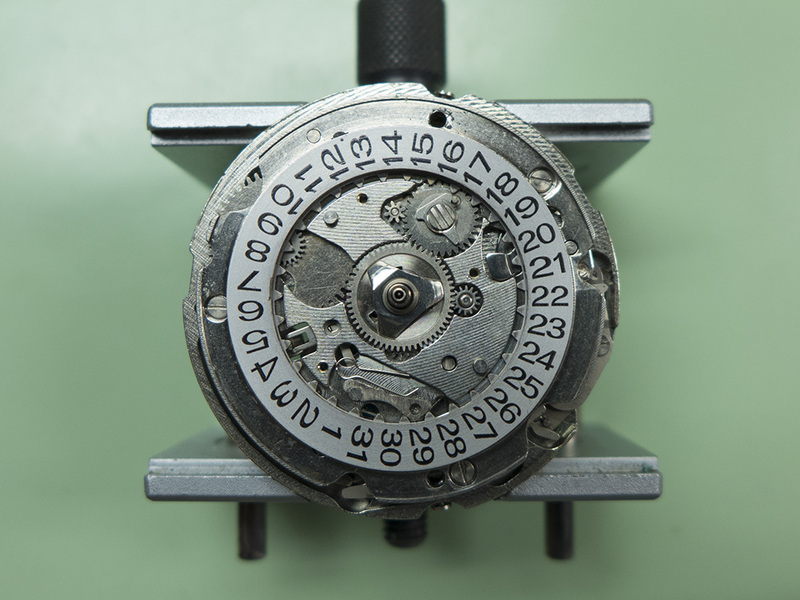 The picture below is with the top calendar plate removed which gives access to the hour wheel and calendar components. As the strip down continued it was apparent the movement suffered from a bit of over oiling, the plates were awash with it! I’d much rather see over oiling than too little though. The barrel was covered in oil too. Note the alarms spring recessed into the mainplate, this provides the power for the alarms hammer that fits in where that big hole is. 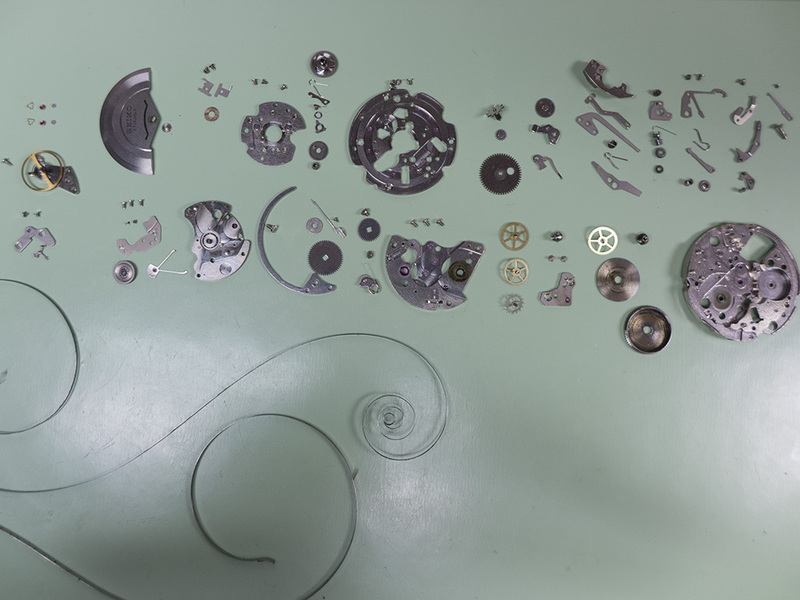 The watch was fully stripped ready for cleaning and inspection. 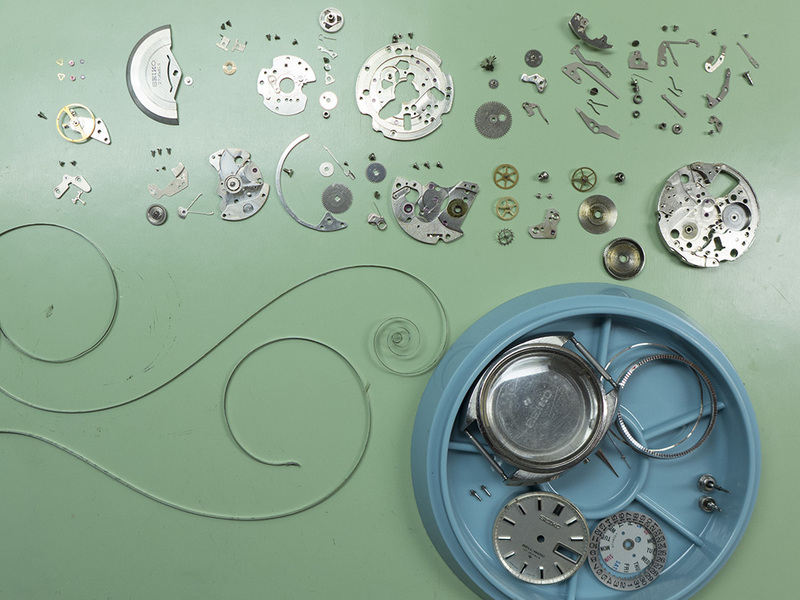 Once everything was clean and dry the reassembly commenced, it’s always the mainspring into the barrel first for me. That’s better, just the right amount of lubrication this time. The motion work back together and ready to tick. 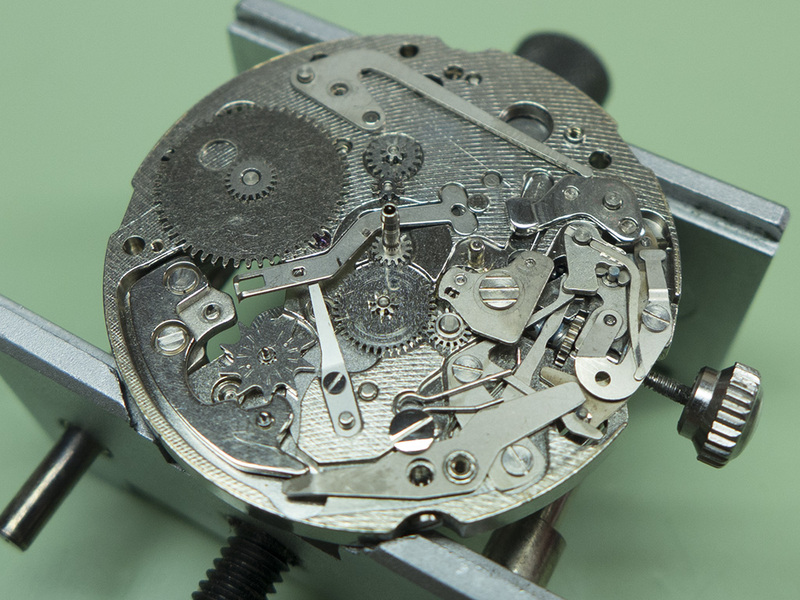 The alarm layer with all it’s coupling levers and hammer, it’s quite tight for room in this calibre movement. Ready for the day wheel and dial, this means the it’s time to sort out those broken feet. 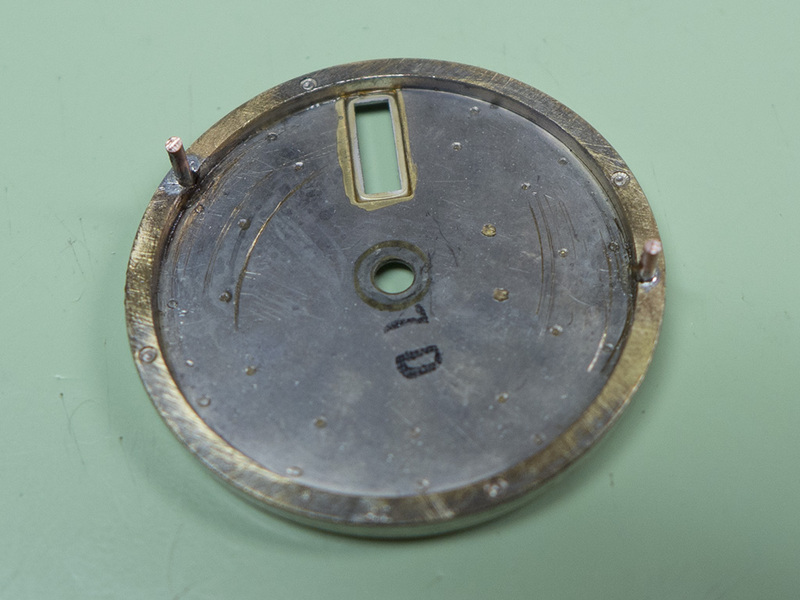 The recesses for the feet are cleaned up and a suitable gauge copper wire is used for the new ones. 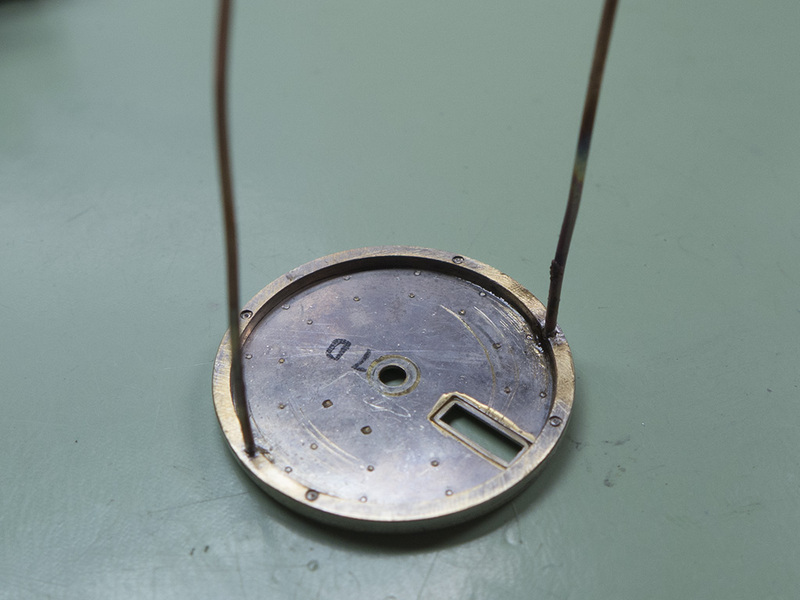 The joint is fluxed and some chunks of solder arranged around the base of the wire, the wire is then rapidly heated up and as soon as the solder flows the current is cut and the dial cools again. 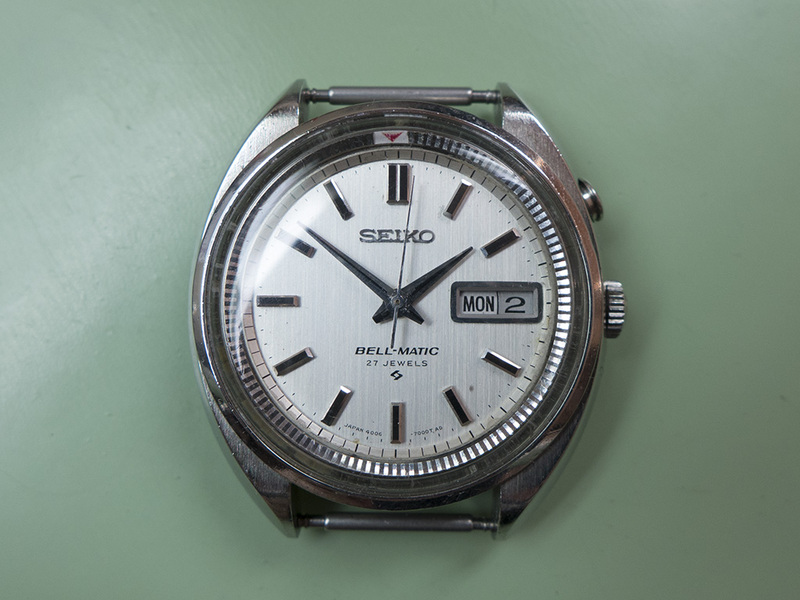 Because the heating and cooling is so rapid it doesn’t affect the delicate print on the dials face. 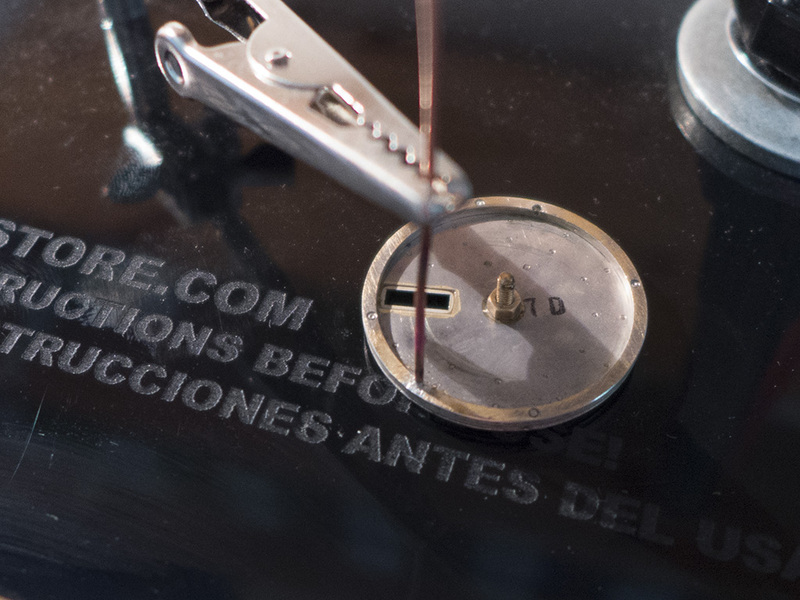 The wire has been soldered in place in the picture below. Do the same for the other foot and they just need trimming to size. As can be seen the process doesn’t affect the print on the other side. The feet are trimmed and it’s ready for fitting. 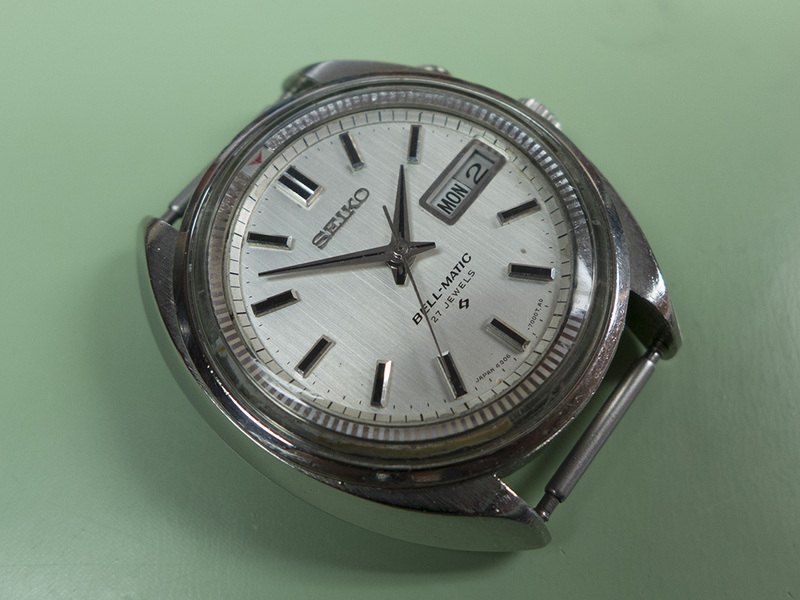 ….as is the repaired dial. A final shot before closing…. …and there she is, good for another few years.